The Comfy Comfort Harness is a brand new harness that is designed to be comfortable and better for your dogs. Unlike collar and leashes, the harnesses is a more humane way of controlling your dog as it doesn't put pressure on their necks and shoulders. These harnesses are similar to the ones made by Puppia Soft Dog Harness. With your help we can reach more people and let them know about Comfy Control Harness whether this product works or not. Thanks for saving me time and the loss of extreme amounts of hair for a product that seems to be in the best interest of dogs. How people can rip dog-lovers off is beyond me so thanks for sparing me from this horrific company. As seen on t.v sales are test products but the scam is simple: Create a whack product, misadvertise and mislead - one is free but the processing fee and shipping and handling are ridiculous for each and you send junk while holding the money long enough to draw good interest then by the time word gets out that it's crap, you're rich! I was about to buy one of these after seeing a commercial but googled reviews for the product and found this site. Thank you all so much for sharing your experiences and saving the rest of us from getting ripped off. I got mad just reading all of your horror stories so suggest, like another reviewer, that you contact your state attorney general and report the scam. Those offices can be effective in shutting down scam businesses. Was about to order, then canceled on the website after inputting all my data. The next day received an email saying that the order is shipping and the charge for shipping exceeds the product total. I callsed my credit card to dispute and will have to call the company direct to cancel. After reading these reviews I am not positive this will be an easy task. I will go to WalMart or order from a more reputable company. Thanks for the posts. wasted almost an hour on the phone with autimated machine to get my information. there machine doesnt tell you your going to be billed 3 or more times what is advertized, I did send my complaint to the bbb. to cancel my order i was on the phone with someone from callifornia when you order the harness you give your info to new jersey ??????? I went online after seeing the commercial. I ordered 2 regular comfy control harnesses and a free toy..... This is not what ended up happening. All of the sudden my credit card was charged for 5 harnesses and a toy. My total was suppose to be 14.98 or something close to that... I ended up with a $74.00 charge on my credit card. I immediately called the compay the day after the purchase was made and asked ot cancel the order. They gave me a cancellation number and 10 days later the charge appeared on my credit card. I immediatley called the company and they said, "who did you talk to"... I said "I have a cancellation number so I don't think it should matter who I talked to"... they said "sorry, but there is no cancellation but we will give you $10.00 off your purchase price".. I said "no thank you, I want my order cancelled like I was told it was and here is the number"... he said "the order already shipped"... I immediatley called my credit card company and told them of the situation and disputed the charge.. no problem there. It has been 5 days since I talked to the company and the order has not arrived to me. Very, very shady and I would not recommend using this company. I cannot say if the product is good or not because it has not arrived yet. However, I do believe they rip people off.. what a terrible experience to go through. I too was going to order the harness. So glad I read the reviews and thank all of you for your warnings! I ordered the product and only wanted two and somehow ended up with 5 and they are charging me 78.00... I can't find a phone number to contact them. How do I get them to cancel my order???? I sadly didn't read the reviews until after I ordered this crap. I talked with some guy and he said a the extra large would fit a Lab, wrong not even close too small - sent it back and never did get my credit finally gave up. Never order from this company it is a scam! This website is nothing but a ripoff. i tried to order one and get one free but the site charged me for 2 and another product not even ordered a total of 69.92 and all i wonted was supposedly 10.99 thanks a lot you bunch of theives. I have tried a few harnesses and was glad to see these reviews on this one before I tried it as well. The best harness I have found so far is the non-pulling mesh harness by sporn (easy to find on Amazon). I am a big fan of the gentle leader, though not all dogs get along with them and I have found this harness the best so far. I bought this in a store so I didn't have to go through purchasing it on their website which appears to be a nightmare. Nevertheless, the item is worthless. It did fit my small/medium sized dog well. However, it lasted 3 walks. She pulled during the last walk and completely broke free. The stitching completely came apart. This harness is only good for a toy dog. well I very rarely buy off the infomercials. I wait until the item comes into the stores. Usually not a long wait.This product is terrible.Very awkward to put on and made poorly.Glad I didnt have to pay shipping.Got use out of the laesh though. I was just about to place an order and read the reviews. won't do it now. thanks to all the info. I will however try to find it somewhere else, or buy something different. Was checking out the website today, thinking about ordering..........Checked for reviews first and I am so glad you all posted. I will NOT be using the website or possibly the product but will look elsewhere and still ck reviews on anything else I find. PHEW!!! Thank you so much! Wish I could give this a negative rating, I agree with the majority here. Stay away!!!!!! a HUGE thank you to everyone who posted...i was lured in by the "awesome" commercial too, i have a 60 lb. Shepherd mix, and figured this would help with the pulling. guess i will be taking a trip to petsmart to have an actual person consult me on what is the best to buy and avoid horrible customer service. such a pet peeve of mine, as well as being ripped off (im sure most would agree). thanks again for helping me avoid a massive migrane!!! I ordered this product about 3 months ago, it was a "buy one, get one free with free shipping" last week, my account was charged...was it $19.99 like advertised? Absolutly NOT! I was charged $63.92, they sent me a total of 4 harnesses, 4 leashes and two of their crazy critters. When I opened the package to try it on my English Labs (both under 2 years), the XL did not fit either one! So now, I am stuck with 4 harnesses and leashes that I can not use. After reading the terrible reviews about the returns I will give them away to my friends and family. Do not order this product! Last week I attempted to order 1 Comfy control harness for my lab. I went online to the site to place the order. I saw that the large would fit my dog's size, per their sizing chart. When I got to the end of the order I had somehow ordered 4 sets (even though I had only put in the order for 1) for a cost of $165.75! I was charged for shipping, even though it states on the website that there is free shipping (who knew handling costs were so crazy expensive!). I was also charged for the ones I was supposed to get for free, as a part of the buy one get one free deal! I called right after I placed my order, confirmation number in hand and they had no record of my order. I was told to call back in 24-48 business hours. I asked if my order could be amended and I was told that it takes 24-48 business hours to process it all. I called tonight to amend my order, but thankfully found this website first. (THANKS EVERYONE!) I told them I wanted to cancel my order. When I was asked why, I said that I got one as a gift (just a little white lie). even after saying I got one as a gift, they still tried to get me to keep my order. I said no, I would like to have the whole order cancelled. After a lot of typing I was given a confirmation number and told twice that the items will not be sent and my credit card will not be charged. I will be studying my bank account for the next few weeks to make sure I truly don't get charged. I ordered this product telling the person that I ordered from that I needed it in less than a week and because I was leaving on a trip, they said I would have to pay $9.99 for each harness for expidited delivery within 3 working days. I placed order on 8/21 and it is now 8/31 and still no harness. Will dispute order with my credit card company. DON'T BUY FROM THIS COMPANY..IT IS A GIANT RIP-OFF! The ad clearly states 2 for 1, when in reality that's not the case at all. We were not only charged for both harnesses, but the shipping was FIFTEEN dollars, so this "2 harnesses for 10 dollars" actually cost FIFTY SEVEN DOLLARS. Needless to say we cancelled our order. DO NOT BUY through their website or by phone! Once they have your payment details there is no way of cancelling the order! Everything as mentioned above happened to me.. I called them right after they had placed my order (I never placed or confirmed it)...because I noticed a mistake on that "order". I was told that I have to call back in 24 - 48 hours... that they would put a hold request but could not guarantee it.. I found it all very odd and suspicious .. so, I requested the order to be immediately cancelled... well same here.. not possible have to call back the next day or the day after (which is a Saturday!!)... I contacted my CC company and they cancelled the card immediately. I feel so silly to have fallen for that scam but the site is so cleverly set-up... and it makes me sick to the stomach to think about all the people who are being ripped off right now!!!! PLEASE STAY AWAY - I am off to Walgreens... apparently the harnesses are available there. BUYER BEWARE....this product is not conducive to a medium to large dog. The sizing chart is deceiving. I ordered a large for my 45lb border collie mix....the velcro barely met, therefore it kept detaching. The quality of the product is def NOT strong enough for the larger dogs. It seems that it would rip easily as the dog trys to pull. Also....it is NOT worth the time, effort, gas money, and return postage to send this product back. The shipping and handling were almost the same price (16.98 and 11.98). When all is said and done that prob leaves me with about 8 bucks in my pocket after shelling out $32. Well...looks like my friends with smaller dogs will be getting a x-ma present this year. I'm still looking for something for my precious boy. After reading the reviews, I found the quality product at Petco for $24.95. Glad I didn't order these. Thanks to each of you for your review and I'm sorry you had a bad experience. Your 10 collar becomes a $51 and if you decide you don't want it and go out of the site they charge you anyway. I am cancelling my card as well. I am mad. Probably China as usual. The ordering process goes from $10 to $50. If you do this cancel your credit card immediately as it will never be resolved. Lots of expensive advertising, looks good but is VERY BAD! 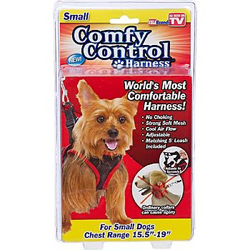 i have read a lot a bad reviews about the company being a scam but you can buy the comfy control harness from walmart i got the small one for $10 and it fits my 10 pound dog very well and helps him have a more comfortable walk because he pulls sometimes. Product is easy to use and fits better that other harnesses. But buy from a respected source, like Amazon, ACE, etc....do NOT buy the harness directly from the company. My dog already has a very nice harness from Petco but it's so hot out I thought a lightweight mesh one would be nice. Found the Comfy Control at Walmart. Returned it the next day. It is VERY poor quality including miss-sewn edging with raveling seams and a hole. I was not happy with the size of the harness. I upgraded for free shipping...still got charged for shipping and for the "free" toy! What should have been $18.95 was $31.37 (includes $2.42 tax). I feel the product is not delux. I wonder what the regular product is. I called and stated I'd like to return as some of the stitching ran off the hem...so it will come apart easily in time. I was told if it was defective I would be credited $10.95. I hope so...just called today. I too was falsely scammed on ordering and every time I tried to call and cancel they told me I would have to call back. I gave up and will report to AMEX. Read the reviews and beware! This company are SCAM ARTISTS from the gitgo! More China junk and very falsely advertised. The process of ordering is misleading so that you end up ordering two sets of two and you have no way of undoing it. When you call the foreign call center - they say they will cancel the first order, but they never do. You receive the first order - I asked for Large for a pit bull - this should have been for a sheltie - and then when I figured out I had two sets, I called the customer service again because I have already been billed for both orders and they told me I had to pay the postage and be reimbursed. They can't do it right the first time or the second, why trust them. I can't comment on the product but after my negative experience trying to order, and reading the reviews, I am glad I was spared the headache. As for the folks (very few I might add) that managed to get the harness and was satisfied, can you spell " Lucky "? No one sells a product that is totally based on the correct size without a sizing chart! Give me a good old fashion conversation with a sales rep when trying to order a product your interested in but know nothing about. And thanks for the 411 on speaking to an American, I too am fed up with having to understand someone that does not speak English. This whole experience has been a joke and a waste of my time. well, I was considering purchasing this for my dog, but it appears that this harness is not sized right, especially bad that there is no sizing chart, no info on dog weight rating for strength etc. I think I will check out the petsmart one though. Appreciate people taking the time to write their reviews. There needs to be a "no star" rating for this company. I experienced the same things as the other reviewers. I was charged $51.00 for 2 harnesses (buy one/get one free) and free shipping. I called (India?) and was told the item was on backorder, so I cancelled it. (Didn't get a cancelation number) :-( Three days later I was billed for the harnesses, so I called and was told it was shipped the day I had cancelled it. Huh??? So now, if I ever do get a refund when I return it, I'll still owe over $10 for shipping and handling. One thing I learned about a "talking to India" law: Any time you call an 800 number (for credit card, banking, charter communications, health and other insurance, computer help desk, etc.) and you find that you're talking to a foreign customer service representative (perhaps in India, Philippines, etc), please consider doing the following: After you connect and you realize that the customer service representative is not from the USA you can always ask if you are not sure about the accent), please, very politely (this is not about trashing other cultures) say, "I'd like to speak to a customer service representative in the United States of America." The rep might suggest talking to his/her manager, but, again, politely say, "Thank you, but I'd like to speak to a customer service representative in the USA." YOU WILL BE IMMEDIATELY CONNECTED TO A REP IN THE USA.That's the rule and the LAW. It takes less than one minute to have your call re-directed to the USA. Tonight when I got redirected to a USA rep, I asked again to make sure - and yes, she was from Fort Lauderdale. Imagine what would happen if every US citizen insisted on talking only to US phone reps from this day on. Imagine how that would ultimately impact the number of US jobs that would need to be created ASAP. Remember - the goal here is to restore jobs back here at home - not to be abrupt or rude to a foreign phone rep. You may even get correct answers, good advice, and solutions to your problem - in real English AND...never give your billing info BEFORE you see the final total. That's how this scamming company gets you. I have a Corgi and oredered a large and an XL. the XL barely fits! Got help anyone who owns a Lab thinking the XL will work for them! We ordered a large for our 55# dog. When we finally received it (3 months) I could not get it on her, way too small. I called and was told they only have sizing for small and medium and we could return it and they'd send us an xlarge. Will wait and see what happens next. Not happy with rep on the phone, very abrupt and unfriendly. Rec'd it yesterday - I had upgraded to the "deluxe" the only difference between that and the other one is its more expensive. I can imagine comfy cozy harness people laughing at these reviews because sadly we all still paid for the crappy item. And customer service is AWFUL!!! I work for Alpine Access and we'd be pulled off the phones and fired immediately if we talked to our customers like that. :| NOT HAPPY. BEWARE.